Maria, Amy, Cecile tagged me on this one. I've already shared my story how I met my husband. After we both graduated from college and landed a job, my husband's parents were pushing us to get married. However, I was not really emotionally stable at that time. But by the time I felt I was ready to settle down, my father became sick of cancer. He would've wanted to walk me down the aisle, however, I couldn't concentrate on these things at the time. I opted to take care of my dad first because he was already dying. He passed away on February 2001, but he already gave us his blessing. On April 2001, Glenn proposed. Actually, I had no idea that he would propose that day. Glenn was even asking me to change my outfit because I remember I was only wearing shorts and blouse fit for malling. But I did not change. I was only curious when he took me to a fancy restaurant. There was no special occasion at all. Anyway, he finally popped up the question with a ring on his hand. 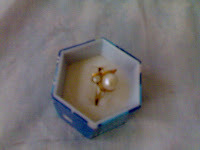 The ring has a pearl and a diamond stud. Of course, I answered yes... We got married on January 12, 2002, almost a year after my dad passed away. 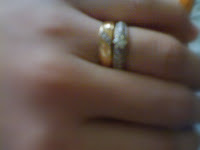 Few months after we got married, he gave me another ring. We call it post-engagement ring and I've been using that ever since together with our wedding ring. musta na diay tuod imo friend? Cooks, thanks for accepting the tag :-), and for letting us know you a little bit more :-). Take care always ! Cooks I am here getting ready to go out for shopping but i feel like checking my blog. And now I am here reading your love story. Thank you so much for sharing this to us. I love pearl I have some collection of pearl since i left Phils. I don't know why but i love them than gold jewelries. I am so much happy for you and your husband. I think this all happening because of the next generation. And our babies is about time to be born. lol!